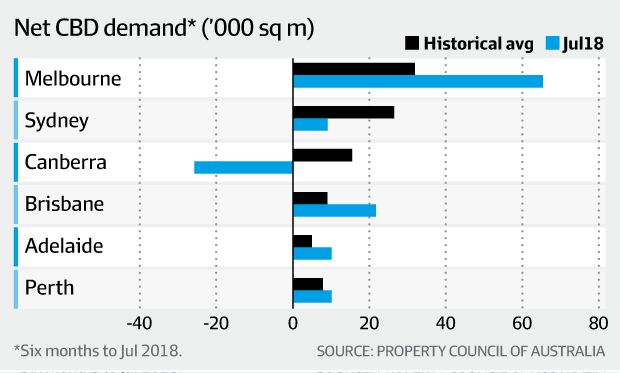 Every capital city in Australia now has a lower percentage of available office space to rent out than it did six months earlier following big shifts in supply levels and strong demand from businesses. Australia’s falling unemployment rate is being reflected in more space being taken up by white-collar jobs, most particularly in Melbourne where the level of demand, in terms of square metres of space leased, is now twice that of the city’s historical average resulting in a vacancy rate of just 3.6 per cent. Around the country demand from the resources, state governments, infrastructure and engineering and most significantly the phenomenon of co-working groups such as WeWork have driven the demand. The average vacancy across the country is now down to 9.1 per cent, down from 9.8 per cent in January. “Office vacancy rates are a good measure of economic performance, and Melbourne is clearly the stand-out performer of the nation,” said Ken Morrison, chief executive of the Property Council. Despite hits to jobs such as Telstra where 1000 workers are to be cut there have been big leases from co-working hubs, with players such as Hub Australia and US giant WeWork expanding rapidly. “The activity can be attributed to a range of industry sectors, but it is co-working operators making the real difference, especially in Sydney, Melbourne and Brisbane,” JLL’s head of office leasing for Australia Tim O’Connor said. The head of office and industrial leasing for one of the largest landlords in the country, Dexus’ Chris Hynes, said the key driver had been from the smaller office users. 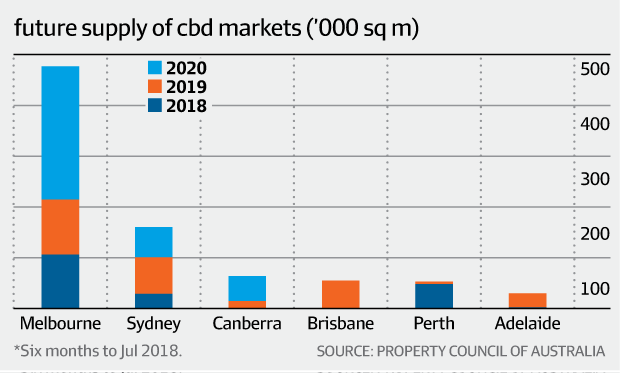 In the resource-backed cities of Brisbane and Perth vacancy has reduced further with groups such as ConocoPhillips Australia on the hunt for about 10,000 square metres and the Queensland state government still holding the biggest new office space requirements. Canberra was the only capital city to record negative net demand over the last six months. 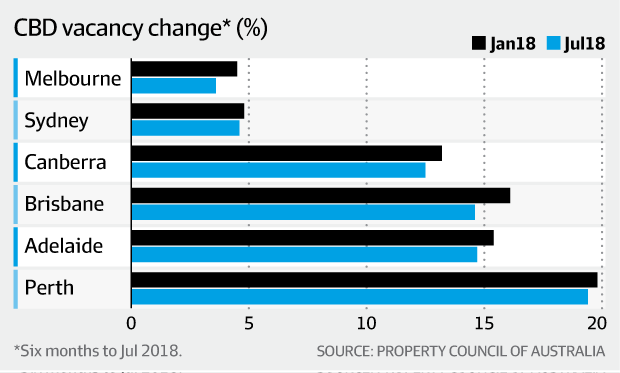 While demand has been the key driver around the country, the PCA statistics show that any reduction in vacancy from changes in supply was largely confined to Sydney. There, the amount of withdrawn office space for either redevelopment, refurbishment or demolition was the same level of the newly built office supply coming into the market. Corporate Property Strategists principal Peter Messenger said the current conditions in Sydney were “a moment in the sun” for landlords. Concerns about future supply levels should also be brought to attention. The concerns are sharpest in Melbourne, which is expected to produce around 500,000 square metres of new space in at least 12 new buildings in the current two to three-year cycle.